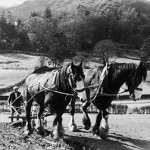 Historically farming in the lakes would have been on a small scale. Small family farms existed by farming a mixture of stock and crops. Ducks, pigs, sheep and cattle could all be found whilst the fields could be sown with arable or fodder crops (such as turnips) alongside the traditional meadows cut for hay. It was a hard existence for those who lived amongst the mountains, scraping a living from thin soils and a harsh environment. The time during and after the second world war was a period of intense change in agriculture in the uplands. Advances in technology from the widespread availability of chemical fertilisers, cheap oil, pesticides, advances in machinery coupled with a national drive for food security after the austerity of rationing and food shortages. Listen to the audio below to explore how the movement away from traditional methods of farming the land, has impacted on the landscape and wildlife. 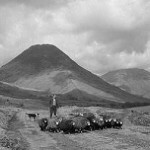 The modernisation of agricultural practises, combined with government subsidies, enabled farmers to produce more fodder for their stock, and keep more sheep on the fells. It also corresponded with a decline of some flowers and other wildlife. Listen to those who remember the changes after the war, but also now see some of the wildlife of their childhood returning. Bracken stands can be a distinctive feature in the landscape and can benefit wildlife too – from rare butterfly species like the high brown and pearl-bordered fritillary to birds such as the whinchat and stonechat. 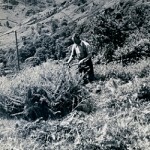 Historically, bracken has been used and managed by people too. Many of the valleys in Cumbria would have once contained flower-rich hay meadows, grown to produce winter feed for sheep and cattle. 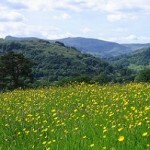 Sadly, hay meadows have suffered a catastrophic decline since the Second World War. The change in farming practise from the use of horse and manpower alone to the mechanical age had a dramatic influence on farming practises, and also on the landscape and wildlife. 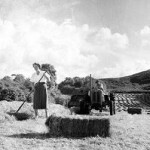 Traditional farming practises would have been very different 60 years or so ago. 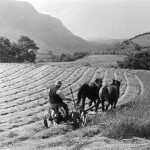 There were few artificial fertilizers or pesticides and silage was not yet widely made. Where you may now see machinery and tractors, and black plastic silage bales in many of the fells and dales, you would have once seen horses, carts and men working the fields by hand.